Survive Winter Like a Mainer! 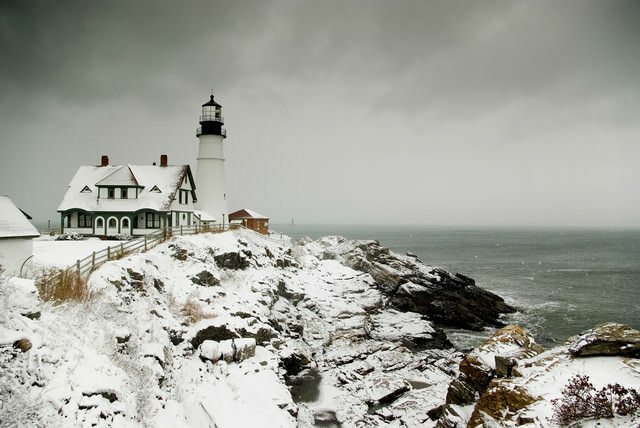 Home|Blog|Uncategorized|Survive Winter Like a Mainer! The weather reports indicate some unusual winter storm patterns, with record warmth in some areas, but colder than normal and snowier reports in other areas. Here in Maine we are fortunate to be enjoying a relatively mild winter, but that’s not the way winters usually pass up here! As a result Mainers have a pretty good collective knowledge about surviving the worst that Mother Nature can throw at us. So we talked with a few winter weather veterans to find out how they make the best of cold, snow and the inevitable power outage. A good cross-section of Mainers use firewood as a supplemental or primary source of heat in the winter. Inevitably, the conversation turns on several points of interest: How much wood did you cut/split/stack? ; How much wood did you burn? ; and How much green wood will you order this spring? Comparing cordages can cut quickly to the conversational “chase” and is almost as popular a topic in Maine as the weather. No matter how much you burn, proximity of the woodpile to the woodstove becomes an important factor when the depths of winter settle in. In Marion’s childhood, her family shut off the “summer kitchen” located in the ell of the home that connected the house to the barn. The ell then acted as buffer between the weather outside and the warmth inside. Then firewood was carried in and stacked in the winter kitchen area against one wall to eliminate extra trips outside for wood. Modern winter planning should identify locations for the woodpile that is easily accessible after snow plowing has been done. 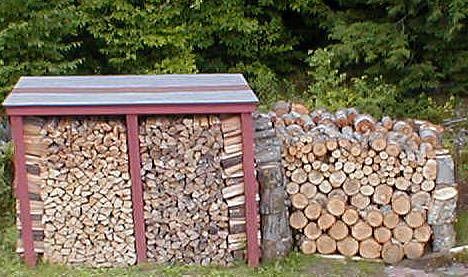 The woodpile should also be covered with a tarp or roof overhang to keep it relatively dry. A secondary stack inside that is accessible via a wood lift or pass through door can make the wood stove more convenient to use. Marion remembers the exact year when electricity came to her home: 1935. “Before that we had candles and oil lamps to study with.” Water was a little easier in her house than her neighbors’; her father rigged a pipeline to connect the pump servicing the stage coach horse water trough across the road to come up to their house. Other plumbing consisted of outhouses. Present-day families still need to consider the possibility of electricity outages and the ways that will affect accessibility to the basics of comfort: water, heat, light and cooking. Many Mainers who lived through the Ice Storm of 1998 invested in emergency supplements to electric powered devices. Generators—powered by propane, gasoline or natural gas— are now standard appliances in many Maine homes, especially rural homes with private wells and septic systems, which are powered by electricity. Lights and heat can be provided by a number of sources: a fireplace or woodstove, candles, oil lamps, battery powered lamps and flashlights. Meals can be prepared on a gas range stovetop, lit with a match. (Avoid trying to use the oven as the electronic ignitions will not work.) Water can be heated on the woodstove, and if it’s not too frigid outside the barbecue grill can be drafted into winter service. Freezers can maintain a pretty cold temperature for 24-36 hours if the door is kept closed. For the refrigerator, or chest freezers, packing clean snow into plastic grocery bags can keep fresh food cool. Make sure you put the bags in a pan to catch the melt off. If you’re a gadget hound invest in an adapter charge cord that can be plugged into a car cigarette lighter outlet to top off batteries in phones, music players or laptops while you’re commuting or running errands. 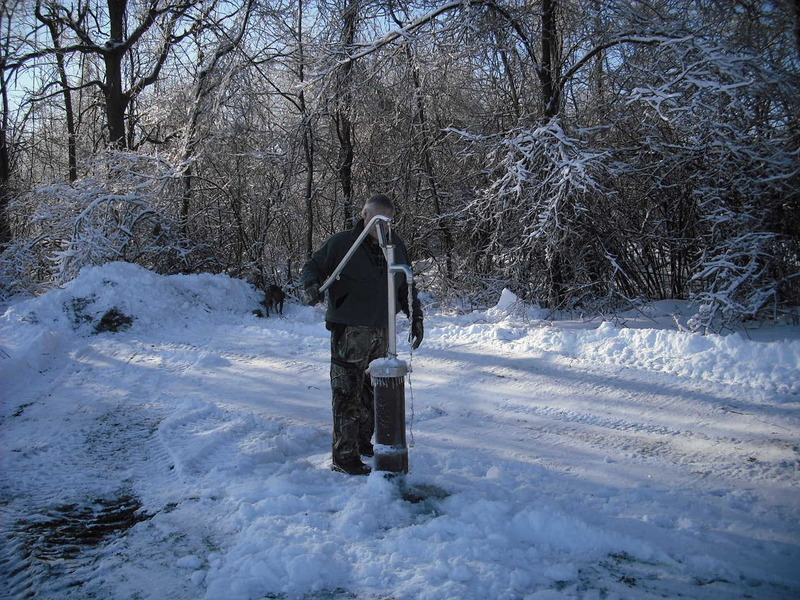 If you’ve never lived in a wintery climate or are shifting from an urban setting to a rural one, snow management is another aspect to consider in advance. If you’re hiring a plow company to clear your road, driveway and dooryard, have them come to the house and review your paths, areas that need to be kept open, areas where excess snow can be pushed. You’ll want to mark perimeters of paved areas with survey sticks with a bright bit of plastic tape tied to the top for extra visibility. Don’t forget to mark where propane or oil tank fill spots are, as well as the location of your well head. One handy tool that you’ll want to have on hand is a roof rake (right). Roof rakes are made of lightweight aluminum and extend as long as 16’. 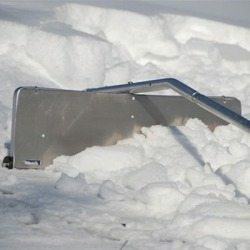 The roof rake is used to scrape or pull off the snow that accumulates on the roof areas to reduce the formation of ice dams. 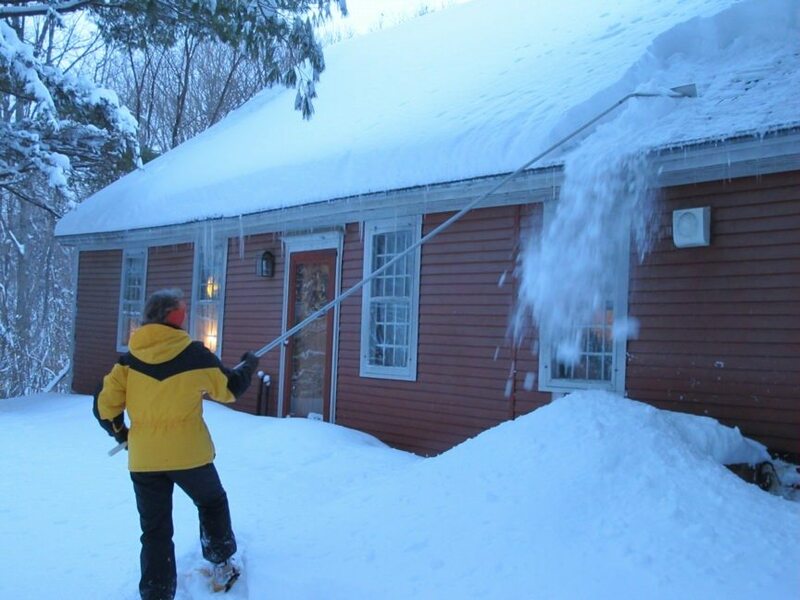 Ice dams can form as snow melts and refreezes on the surface of the roof, causing water to backflow up under the shingles and into the walls and ceilings inside. The rake can clear the roof in a fairly short time, and it’s a great workout if you’re vigorous in your approach. Roof rakes are most easily used on rooflines a single story high; if your roof edge is higher than 12 or so feet from the ground, you’ll probably need a professional to come and shovel the snow off the roof. Marion had plenty of stories about how she and her friends and family enjoyed the winters in Maine. Skiing, sledding, toboggans, and ice skating were all happy memories for her. She often spent hours outside, coming in only to swap out wet mittens for dry ones. 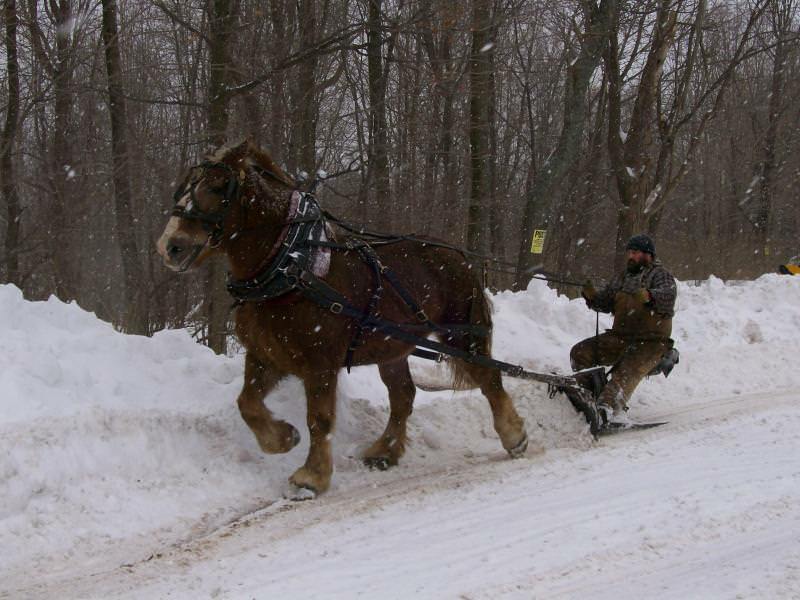 As a girl, she recalled watching the horse-drawn snowplow clearing the roads, the postman delivering the mail with horse and sleigh, and burrowing down into a pile of hay in the back of a truck taking them to the nearby skating pond. Modern families can also embrace the winter season by making outdoor activities in cold weather a priority. Skiing, snowboarding, snowmobiling, hunting, skating, ice fishing building snowmen, even snowball fights can help to create memories for your families that will be just as special as Marion Reed’s memories.